Charming, smart, witty, with a definite DIY attitude, Shari Elf writes the sort of songs that make you laugh, cry, and think all at the same time. You could throw words around like "quirky" and "lo-fi" to describe her songs and you would be correct, but you would also have to include "unpretentious," "catchy," and "honest." And, quirky and funny she may be, but there's still a serious and often darker side to Shari's songs running just underneath the surface. She's brave enough to allow the songs to be true to themselves. Armed with a striking wit, a penchant for swap meets, and a crochet alligator companion named Bunny--Shari Elf is ready to force goodness upon anyone willing to listen. Roy: For anyone who has never heard your music, tell us about S. Elf in one sentence. Shari: Ooh, just one sentence? I often say funny little folk songs but I don't think that's quite it. 'Cuz there is some undercurrents of darkness, they are not purely sweet and cute songs. At least that's what I heard someone say once. Roy: What is your songwriting process? Are you a words first kind of writer or does melody come first? Shari: The very first time I wrote a bunch of songs--and many of those turned up on my debut album (I'm Forcing Goodness Upon You)--I had been dating this guy who wrote songs and I was so impressed with him. I was about 23 years old. After we stopped seeing each other, I realized i mostly liked him 'cuz he wrote songs. So I went to the swap meet on Maui, where I was living at the time, bought a used guitar for about $25 and went home and looked at all these poems I had been writing for years. I sat down and that day put maybe 5 songs to music; including "Tenderness vs. Watering the Lawn Backwards," "Ron's Appliance," and "Beach Chair Song" and "The Wonders of Me," which will hopefully be on my upcoming album with my band, The Kittens. I don't think I ever start with a melody. I wrote the song "my automobile" with a musician friend on Maui, Ray Ujimori, I wrote the lyrics, he wrote the music and I think we may have had his music for that song first. Roy: Tell us how you first got started writing songs? Shari: Oops, I think I already told you. But I enjoy telling how I started writing funny little stories. I think I was in 7th grade. I would sometimes get bored during summer vacation. one day no one was home to play with and I had read every book on the bookshelf in my closet. And the book mobile wasn't due for a couple days. I finally broke down and read "The Romance of Shells." It wasn't so bad and in fact inspired me to make some shell animals out of shells I would find on the beach that was across the street from our house in Kihei (on Maui in Hawaii). Then I finally read "Trout Fishing in America" by Richard Brautigan. 2 pages into the book I realized it wasn't specifically about fishing or trout but it was a really funny and poetic book. when i went back to school that fall, at the private school I went to, I found a bunch more books by Brautigan in the library and read them all and then spent my free periods in the typing room with my friend Lisa Hoskinson. She loved writing stories, too, and we'd compete to see who could write the funniest stories and make our friends laugh. I think mine were funnier. personally. I wish I had some of those stories! Most are gone. But I kept writing. I got an A plus in my college English class because of the journal I turned in at the end of the semester. My teacher had no idea I had a sense of humor, I was really quiet in class. I don't have that journal, either. When I moved to San Francisco with my boyfriend, Preston Mitchell, who I ended up marrying, I took some writing lessons from Norman Wilner, who had advertised somewhere. I still have a lot of writings I did while working with him and those are some of the poems I later put to music. Roy: Can you name a few of your favorite songwriters and tell us why they are important to you and tell us what you have learned from them. Shari: Leonard Cohen is my favorite singer/songwriter. Some people think he's depressing. I really hear the humor in his songs. And the beauty of his words and music. Sometimes I use a line from his song to stress my idea that Jesus actually had a really great sense of humor. Why else would he attract those crowds? Do you think he was boring like most preachers are? Heck no, I bet he was hilarious. There's that line from "Jazz Police": "Jesus taken seriously by many... Jesus taken joyous by a few." I'm not religious but I like Jesus. And I appreciate the pain in Cohen's music, also. In "The Story of Isaac" I've always loved "The trees they grew much smaller, the lake a lady's mirror." What a sweet image, that lady's mirror of a lake. I love The Handsome Family. As I understand it, when Rennie met Brett he was singing his mediocre country songs and she came along, a nice Jewish girl from Long Island who was a writer. There was this cashier who was always crabby to them and she wrote a song about her called "Arlene" where a man kidnaps her and makes her live with him in a cave and be his wife. I think it's kinda fun some of the things she writes that Brett is willing to sing. Much of her words are dark but there is also a lot of depth and beauty and humor. I've talked to her about writing and it is hard work for her, she agonizes over words. And I really like Daniel Johnston. I think he's an amazing writer, he writes from his heart and from his pain and it really resonates with me. If I am having a bad day and need to feel better I usually listen to Leonard Cohen, Daniel Johnston or The Handsome Family. What I've learned from them is that everyone has a unique voice and it's best to strip away what's not me and get down to the core of who I am and write from there. Actually, I don't think I've learned that at all, but I'd like to learn that, ha ha. Roy: What are a few of your influences outside of songwriting--that is, who or what has inspired you to write songs that has nothing to do with music? Shari: Like I said above, my writing teacher, Norman Wilner. He'd say "write about what you know." 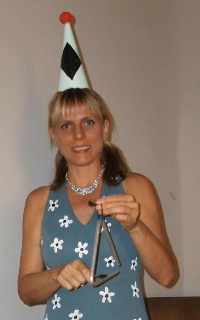 For awhile I was writing about my marriage at the time and my husband's alcoholism. Kinda depressing stuff. I shoulda wrote some country songs. I did write a depressing country song about my ex, Stuart. We broke up about 5 times and for one of the last breakups I wrote a song that started with these lines: "This time it's real, again. I'm leaving you for real, again. You take your furniture. I'll keep the cat." Roy: Have you ever had a song that changed considerably during the recording process from what you thought it was going to be like when you initially wrote it? Shari: Yes, all the time, songs always do that! I think I have no control. Especially recording with my band, The Kittens, right now. But I've willingly surrendered that because I've tried recording on my own and I know what that's about. I have 20 songs I may one day sift thru and release: Shari's Big Garage Band Hits. I know how to have complete control working by myself and I'm bored with that. Plus they all started sounding the same. Working with JP Houston, who is our producer and band-mate, has been really fun. He's written songs for a Canadian muppet-like television show and our album is sort of having a show tunes/television show kind of sound. Very different from my first album. I compare it to Leonard Cohen and his dramatically different album Death of a Ladies Man, produced by Phil Spector. Lately it's my favorite album of his to listen to but most critics and fans of his don't like the album and consider it a failure. Well, it's not so dramatic, but I think this could be like my Phil Spector album, working with JP Houston and Ryan Erskine, my band mates. It's been a really fun process. For one song, that I thought was a throw-away song, "Whispering Horses," when we finished it, we all agree it's our big hit on the album. It's really good. I didn't think it originally was that good of a song when I wrote it years ago but it came out great JP Houston style! 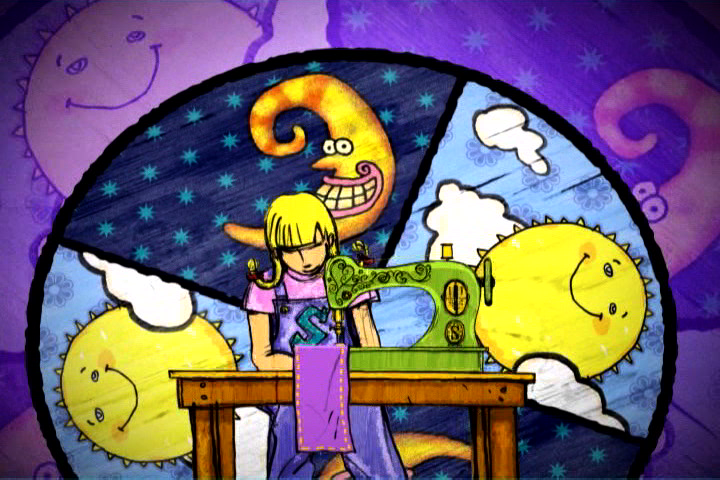 Roy: Your song “Seamstress” seems a bit autobiographical. Is that so? And if it is, how did you come to write it? Shari: Yes, it's very autobiographical. How it was inspired was, I had my own sewing business for a few years when I first moved to LA (after being a nanny for a year and a seamstress in a drycleaner for another year). I had told myself I'd never sew for a living again after I left my sewing business on Maui to move to LA. But I ended up really needing a job when I first moved to LA and found myself doing alterations at a dry cleaners in Pacific Palisades (I once did some alterations for Whoopi Goldberg and Martin Short). I came to my senses and started up Shari's Sewing Service. After a few years I was getting tired of it and taking my art to swap meets and doing ok with it. But this is the really great message I had on my answering machine, "You have reached Shari's Sewing Service. Although we share the same initials as Sid's Sandwich Supply, we are not otherwise affiliated." Then one week I got yelled at by 3 different customers (Well, in all fairness, I had ruined their projects, shortened dresses way too short for a friend and cut expensive fabric for a duvet wrong, I forget the 3rd complaint). So I said to myself "I'm getting yelled at for something I don't even want to be doing any more. I'm gonna try something else, I'll try making a living at selling my art." So in 2 months I had finished up my sewing projects for the last of my customers and was making and selling my art instead. I was pricing my art by charging $20 an hour (that was also my sewing rate) for the time I put into each piece and then selling it at the flea markets of Los Angeles. I worked the same hours I had worked in my sewing business (20 hours a week). The plan worked, my art was priced to move and I was suddenly now making my living selling my art at flea markets. I quickly developed a following and right away I got some art in the movie Independence Day. that was exciting. I sometimes say when I sing "The Seamstress" that writing it was like a petition to the universe that I wanted to stop sewing and sell my art and make music instead, and it worked! And I encourage other people to write songs about the jobs they aren't happy in and the same thing can happen for them! Roy: Some of your songs contain some very interesting subject matter (and interesting titles) such as "Jesus at the Hardware Store, “ ”Jerk-a-lator” and--one of my favorites--"Tenderness Versus Watering the Lawn Backwards." Can you tell us how you come up with these interesting ideas--much less make such great songs out of 'em? Shari: "Jesus at the Hardware Store" was a true story. Well, a man approached me in the parking lot after I had left Orchard Supply Hardware on Bundy in LA. He was dressed like a painter and had long brown hair. I had been going to Marianne Williamson's course of miracles talks over at the Unitarian church by my apartment in Santa Monica at the time. She'd often talk about seeing Jesus in everyone we meet. So I wrote that song on the way home from the hardware store. ("Oh my god! I think that was Jesus!" I tell my audiences regarding that encounter and my epiphany as I was driving home). I couldn't wait to get home, where the song ("Jesus at the Hardware Store") just poured out onto the paper. That was fun, the songs used to pour out, they haven't in a long time. ”Jerk-a-lator” has a little story I tell before I sing it. I was seeing this guy I met at the swap meet. He called and we were talking. Then he got paged--it was back in those days. He said "I'll call you right back." Well, 2 weeks later when he finally did call me back, I had gotten over being upset 'cuz I written this song. It turned out to be my mistake. When he said he'd call me "right back" he was talking in "guy time. "In guy time, "right back" is anywhere from 2 weeks to a year. But in "girl time," "right back" is anywhere from a minute to an hour. So it was my fault 'cuz I was waiting in girl time but he actually did call me right back, it was just in guy time. And thanks about "Tenderness Versus Watering the Lawn Backwards." That was one of those poems I put to music. That song was inspired by another guy I was dating and the crazy lady he was living with (Sylvania, she did call to threaten me but he had also mentioned that she said she was preparing for the storm so I put that in the song). I used to just sit there and write things and words like that would stream out of me. ("He was the kinda guy I'd see in those garden supply store advertisements" that was good if I do say so my S.Elf, ha ha). Also my record deal lady's favorite line was from that song: "He has everything I want in a man, everything I want and more, stuff I don't want." And "Ron's Appliance" was a completely true story, the song almost wrote itself. Only the lady wasn't speaking quickly, she was speaking in a heavy Japanese accent. My friend thought it was politically incorrect to write a song about a Japanese speaking wrong number phone call so I decided to just make her speak quickly. Roy: For those who do not already know you, you have a crochet alligator named Bunny that features in some of your songs and artwork. My friend, Troy Lukkarila, wanted me to ask you what is it like living with a crochet alligator and what part does Bunny play in the crafting of your songs? Shari: Please thank Troy for the great question. Bunny is a big inspiration for me. Can you imagine I almost left her at Reyonnes' corral in Joshua tree maybe 15 years ago? 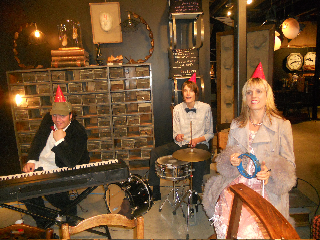 I was thrift storing all day with my friends Ramona and Steve Otto. I actually left the junk store without her and Ramona said "I can't believe you are not buying that crochet alligator in there." I'm kinda tired of spending money, it was $3.50," was my response. But I thought about it and went back in and bought her. For $3.50. She was so worth it! And she really gets upset reliving that story. I try not to tell it around her. heaven forbid I even think of where she could have ended up! Who knows, maybe the World Famous Crochet Museum wouldn't even be here, she is the curator, after all. It's hard to keep up with Bunny. She's got her talk show. She's a practicing mystic. (She's about one million years old but only those who have carefully watched her talk show are aware of this). She plays both a large part and no part at all in crafting my songs. And sometimes she writes them and I steal them from her. She wrote "Ralph, Dog of Peace" for instance. A "Shari's Garage Band Hits" classic. Roy: Have you ever re-written a song after you’ve played it to an audience and why? Shari: Yes, I have re-written some some songs and lyrics. "Happy World" started out as "Holy World." I was making these altars with candles on them with Mary and baby Jesus and I was listening to some early Leonard Cohen records I'd found at a thrift store. I wanted to write a deep song that would go with those altars. Especially on a rainy day in Santa Monica (which was rare) but I don't think I even played it for anyone, I think it was just not quite right. I really don't want to be mistaken for someone who is trying to push religion on someone. But it's weird, 'cuz I am really religious in a spiritual way, not in a religious way. Then years later when I was making I'm Forcing Goodness Upon You in Kansas City with Mark Thies, I was looking for songs and found that one and the idea came to me, hey, what am I all about? Forcing goodness. Happiness. So I tried "Happy World" and it really worked. Better than "Holy World." I think my imaginary audience to "Holy World" didn't get it and that was enough. After playing my new song "Fashion Risk" for a few years, I finally realized in recording it that it makes more sense to sing "I like to take a fashion risk" rather than "I like to talk fashion risks." It's hard to sing "risks." Roy: You also write songs on an instrument called an Omnichord. Could you tell us what that is and how you came to write songs on such an instrument? Shari: Karyn Rachtman was my A&R person from Interscope records. I was possibly going to get a record deal through her and she gave me the Omnichord. Well, it was a loaner to use until I got my record deal. So I guess technically it's still on loan. It was a gift someone gave to her husband at the time, Lenny. She thought it would go good with my image. I took to it right away. Suzuki originally marketed the Omnichord to teachers, as easy to learn, and simple for sing-a-longs instrument. Karyn also was going to have me do some shows in laundromats. I think I have the Omnichord in about 7 songs on my first album. Roy: You’re currently working on an album of music for children. Is it any different writing for a younger audience? Shari: I haven't actually written anything new for the album, I'm still recording songs I wrote years ago. I don't think when I sat down to write those poems and songs that I was aiming at any audience. I more write from the place I'm at right then. And sometimes my goofy little kid inside is writing, sometimes other parts of me is writing. I have never sat down specifically to try and write a children's song, but maybe I should sometime! I read that when John and Paul were writing songs for kids like "Yellow Submarine" they'd use the simplest chord structures possible. I am happy that many families tell me the whole family enjoys my album, including grandma and grandpa. And that makes me very happy. My whole family used to watch Sonny and Cher and Carol Burnett together. I like being an entertainer like that, fun for the whole family. Roy: In addition to writing music you're an artist and run the World Famous Crochet Museum. Is that a lot of work? Where is this museum located? Shari: I do keep pretty busy but make sure I always have some leisure time. I like to go out and listen (and dance) to music and Bunny and I like to kick back and watch movies. Lately we have the guilty pleasure of watching The Millionaire Matchmaker. My teacher, Pat Allen, is sometimes on the show as one of the experts. I don't have a TV so I watch it in iTunes. The museum is right on highway 62 in downtown Joshua Tree, California, which is 2 hours east of Los Angeles down the 10 Freeway. Roy: So, what's next for Shari Elf and Bunny? Shari: Bunny is always dreaming up big ideas. She wants to make inspirational movies and subliminal tapes. I did a story at this years "Desert Stories" story telling fund raiser out here in Joshua Tree and I had so much fun. I had little song clips to illustrate my story musically throughout it and it was well received. I'd like to write and tell more stories, maybe record them and make them available if anyone wants to listen to them. Also I'm studying to be a life coach/relationship coach with Dr. Pat Allen. Her ideas are filtering into my art and will probably find their way into my songs. I just like to keep learning and growing. 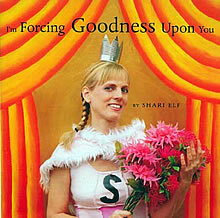 The wonderful animated video for her song "Seamstress" can be viewed at http://www.sharielf.com/news.html as well as ordering info for her debut CD I'm Forcing Goodness Upon You and The Shari Elf Tribute Album.